Welcome to Open Sesame: a press-your-luck card game of high-stakes memorisation and deduction by world-renowned game designer and multiple Spiel des Jahres winner, Antoine Bauza (7 Wonders, Takenoko, Tokaido, Rampage, Hanabi). Take turns alternating between the role of Ali Baba or one of the thieves raiding the Cave of Treasures. As Ali Baba you'll steal treasure from the cave until you're trapped or you flee, and as the thieves, it's your job to carefully observe and recite exactly what it is that Alie is attempting to escape with. 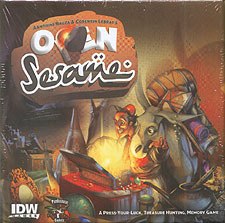 Open Sesame is light-hearted fun perfect for treasure hunters of all ages!